This simple crock pot pork roast is super easy to prepare and cook in the slow cooker, and the sweet sauce adds color and flavor. Use cherry preserves or jam to make the sauce and add a bit of red food coloring for extra color if you like. Or use apricot preserves or pineapple preserves and skip the food coloring. The green onions (scallions) can be replaced with a small chopped onion. The recipe calls for a boneless pork loin (not tenderloin). If you use a boneless pork shoulder roast, increase the cooking time to 7 to 9 hours. The pork roast makes a delicious meal with baked sweet potatoes or rice. For a side vegetable, consider steamed green beans or broccoli. If you serve wine with meals, try pinot noir or an Italian red, like Chianti. A slightly sweet Riesling is a good choice as well. Pat the pork roast dry with paper towels. Trim and discard excess fat. Sprinkle with kosher salt and black pepper and place the roast in the crock pot. In a small bowl, combine the chicken stock, bouillon, green onions, red wine vinegar, and rosemary. Stir the mixture well and pour over the pork roast. Cover the crock pot and cook on low for about 4 to 6 hours. The roast can be cooked longer, but for neat slices, check for doneness after 4 hours. Remove roast to warm serving platter and keep warm. Strain the juices and skim off any excess fat. Pour 2/3 cup of the juices into a saucepan and add the cherry preserves. Add food coloring if desired. Bring to a boil and continue to cook for 1 to 2 minutes, or until slightly reduced. Taste and add salt and pepper, as needed. 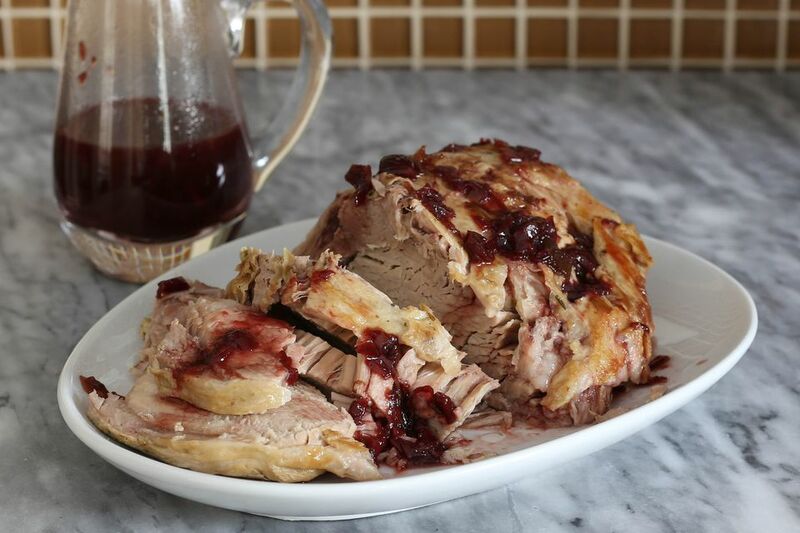 Slice the pork roast and drizzle with some of the sauce. Serve the rest of the sauce at the table. If desired, garnish servings with chopped chives or parsley. Though browning meat for slow cooking isn't usually necessary, a good sear does add flavor, texture, and color to a dish. If you have time, brown the pork roast on all sides in a tablespoon or two of vegetable oil. For a tangier sauce, add about 1 to 2 teaspoons of balsamic vinegar to the saucepan with the cherry preserves.